This simple yet fundamental question is at the heart of whether you are chasing perceived success, which is driven by external factors, or authentic success, which is all about results. The latter removes external measures of ‘success’ and instead focuses on the things which move you toward your goals. Ultimately, whether you chase perceived or authentic success comes down to one powerful question – how do you want to live? 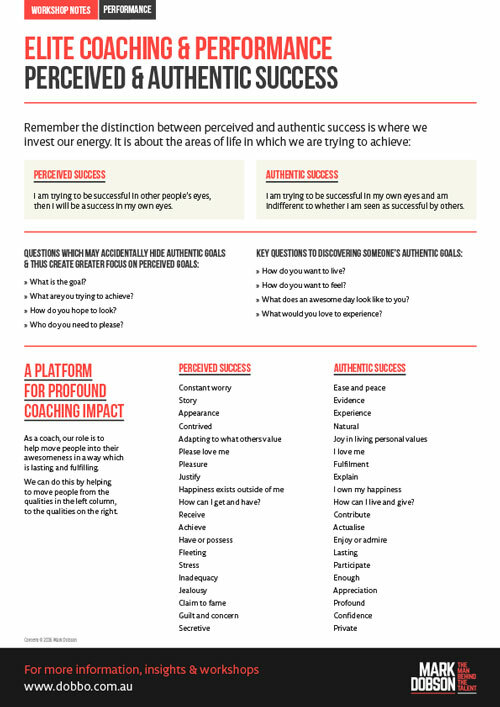 Download the Perceived & Authentic Success worksheet to help you stay focused on the actions which lead to tangible results. Gary Ayres5 x AFL Premiership player – Mark worked with Gary’s players before they played the perfect season. Zero losses.